Home Hosted Dinners are Back! 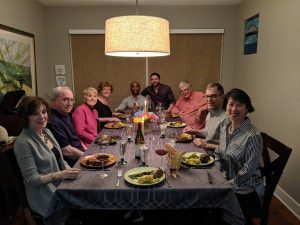 The Member Engagement Committee invites you to enjoy the next set of Home Hosted Dinners to be held on Friday, April 26th. This is an easy and fun way to get to know your fellow Rotarians in an informal setting outside of Tuesday luncheons. President Ed Krishok and his wife Brooke, Andrew Warner and his husband Jay Edmundson, Mike Robertson and his wife Emily, as well as Kristin Bergstrom and Lloyd Dickinson will open up their homes to fellow Rotarians. You and your guest will be assigned to attend dinner at one of the homes. All you have to do is sign up and show up on April 26th. There is no cost to attend. For more information or RSVP to the Rotary office by emailing info@milwaukeerotary.com or by calling 414-276-4425.